In this one day intensive class we explore and learn the techniques of the crystal Vogel Wand which emits a vibration which extends and amplifies the power and grasp of the user’s mind. Intent used within the laser wand,radiates energy in highly concentrated form, and this extremely benevolent energy may be transmitted into objects or people at will. Discussed are Marcel Vogel's defined meaning of the number of cuts within Vogel wands & the design that was inspired by the Tree of Life, manifested to help humanity and to assist in the alternative healing world. In this class you will learn the history of the wand & learn how to use your wand learning to charge, activate it and learn how the wand can bring harmony and balance by renewing energies in the etheric and chakra fields. 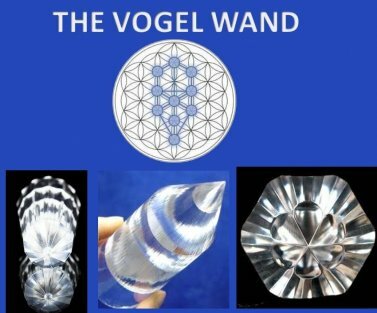 The Vogel Wand is also used as an extraction healing tool, it is an in depth precision crystal light-healing tool and is a must for Reiki, Energy, Shamanic & Crystal healers to learn, identify them and use for your healing work. These classes are for beginners and advance crystal light workers, shamanic & reiki healers. Vogel wands will be supplied if you don't have one, some will be available for purchase. *On a personal note: I often use the Vogel Wand technique on clients, especially when there are energies that don't move in their life, working on all levels of fear or even obstacles in their life. I have also experienced the Vogel technique done on me, the result of great clearings & shifts have occurred. "The Vogel Wand sounds magical, esoteric and too removed to be applicable in an effective way for transformation and healing - is what first came into my mind when I read that a class was being offered. After second thoughts, I said why not, go for it and I emailed to have a spot reserved for me. My experience that Sunday, during the class was seismic, the healing properties were at the highest vibrations and most direct that I’ve encountered thus far, in my journey of learning and applying healing modalities and methods. Through written/spoken instructions, as well as live demonstrations of the work, I was able to receive instant healing from a classmate, and in turn instantly facilitated in healing her. As a facilitator, I’ve had the great honor and blessing of having the teachings of Marcel Vogel passed along to me by “Irma Star Spirit Woman”. Her method of teaching this technique and the radiant energy of her being makes this class a must for anyone who is walking the path of being an advanced healer. We all heal each other on some level, however, with this technique, one is able to diagnose client and perform precise instantaneous healing on a very deep level. The Vogel Wand technique is a powerful gift, left to us by someone who practiced great love, and it is being taught by Irma Star Spirit Woman- who embodies and vibrates love. In a word, I am “overjoyed “ that I now know how to use this magical tool." "I had a wonderful learning experience when I took the Vogel Healing Technique class with Irma. I learned the following and much more when I took the class with her. - how to use vogel wand for healing and purification. -how to use a wand on people with various health situations. She provided a space that was healing and positive and fun. It was like having an loving guardian guide us thru the steps. There was lots of hands on experience and feed back. She was very patient with us and answer all our questions. She encouraged us to keep in touch if any questions. I thank her for keeping the information simple and yet making us aware of how crystal are representative of the light and that they be handle with utmost respect."